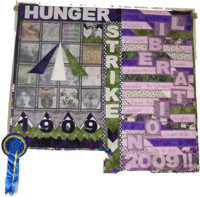 The ladies that undertook the hunger strike went to Holloway Prison, half of my quilt is a representation based on the Holloway Badge, given to those that went to prison and suffered the indignity of being force fed. For the year 2009 l have used the colours of the movement, and covered it all in pink. To give the impression of looking through rose tinted glasses, then cut away some of the pink to release the effect of the colours. A few words represent the impact of being able to vote and the liberation we have achieved. I feel we are liberated to a certain extent hence the pink and feeling of looking though rose tinted glasses. The quote “or is it” at the bottom of the quilt, raises the question that many ladies at home and across the world are clearly not liberated. The methods I used were strip piecing, Jennifer Trollope’s burning technique, machine quilting, heat and bond, free machine quilting, beading, printing onto prepared cotton poplin using a laser printer, and a little hand sewing. I learnt to iron the pictures very soon after printing, as they fade quickly. I had been told you could not use a colour laser printer, but it was very successful. The quilt, I must admit it took a long time and developed over time. I obtained permission from the Mary Evans Picture Library to use the picture from their website.